ATHENA recipients share how mentoring is a parallel relationship and why the value they come away with is important. Few will argue the importance of mentorship and the value that can come from that type of interaction. When talking about mentoring, often times the focus is on what value the mentee comes away with rather the mentor. January is National Mentoring Month and perhaps some of the most qualified individuals to speak on such a topic are past ATHENAs. 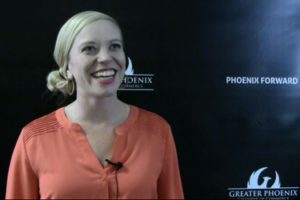 Celebrating its 30th anniversary, the Greater Phoenix Chamber’s ATHENA Awards have honored and highlighted women in the Valley who embody what it means to be a mentor and so much more. ATHENA recipients, both past and present, share how mentoring is truly a parallel relationship and why the value they come away with is just as important. Rachel Yanof was the 2010 young professional recipient and says a mentor is critical in order to be successful in any aspect of life. Yanof believes that a mentor is someone who will listen to ideas and continue to give support, but also understands the value she comes away with as a result of the relationship. As the 2013 young professional recipient, Christy Moore continues to embody an ATHENA by mentoring a youth in the foster care system. She believes it is an important relationship for her and her husband to have.Supporting the child through his journey to adulthood is what inspires her to keep going.